Home Family World East Meets West – What Does Lunar New Year Mean To Me? East Meets West – What Does Lunar New Year Mean To Me? As most of my readers here at Aussie Pete are aware, now and then I tend to move away from the jovial posts and articles and offer up my thoughts and reasoning on some more serious issues. As we move toward the Lunar New Year (Chinese Year of the Ox), I want to take some time out and reflect on the profound changes that I’ve incurred in my life since the mixing of my western ideals, culture and traditions with those of my Shanghai-born and raised wife (Sammi). Growing up as a young child on the beaches of the Sunshine Coast in Queensland, Australia, I was accustomed to the usual vacations and celebration days – religious and non-religious alike… Xmas, New Year’s Day, Australia Day, ANZAC Day, Labour Day, Easter, etc… although each day has it’s own meaning and is interpreted in many different ways by a variety of people, as a vibrant, fun-loving kid, I was always excited when holiday time came around – it would give me a sense of fun and offered time to be spent with family, friends and lots of play. As I have aged (a little), my perspective on things has changed somewhat… for example, instead of worrying so much about what I was going to receive as a present on Xmas day (as most kids do – remember not being able to sleep with the excitement of Santa visiting? ), I get a deep sense of enjoyment now by seeing the eyes of loved ones light up when I give them something that they really desire – this is especially true when it comes to seeing young children on the receiving end – there is absolutely no hiding the absolute joy!! I was aware also at a very young age, that other countries and cultures celebrated different days and for different reasons, but perhaps these reasons are lost on the average western child that has not traveled much outside of his (or her) own country. Chinese New Year to me at this young and impressionable age, was a day when the many people from the Chinese community got together to eat good food and play. Perhaps in mind, it was similar to a combination of Xmas and New Year’s day for Australians, without the visit from a rotund, jovial bearded man in a red suit. Today I am much wiser - and I am extremely grateful for this new-found wisdom. Over the last decade or so, as a result of business dealings, I have had the good fortune to be able to travel widely across the globe and spend some real serious time entrenching myself into different cultures and ways of life. I have seen many things (good and bad) and have experienced many more. After a lengthy courtship with my (now) wife, we were married in Shanghai three years ago. Throughout the ‘getting to know you’ phase, I began to experience the real richness of Chinese culture, but still (in hindsight) I was just touching on the depth of thousands of years of tradition. Our marriage in itself was a wondrous experience, and something that words could never describe. My first celebration of Chinese New Year in Shanghai was in early 2007, and I was actually mind-boggled to say the least. The culture, beliefs and traditions that are associated with the Lunar calendar are very serious to those close to me in China. I have been educated in many ways by family and friends. On the surface, the celebration of the New Year is as I imagined as a child – eating good food, spending time with family, playing and relaxing. In reality, the good food and playing are an integral part of the time spent with family. One of the largest differences between East and West cultures, is the family angle (and obligation – I could write a whole other article on this subject… and maybe will in the future). Over time, I have been accepted by all my family (immediate and extended) in China, and am very humbled to be a part of such a very special time. CNY can also be a very spiritual time, and this can be attested to by the huge number of people who attend the Buddhist temples across the country on the first morning of the New Year. Anyone who has been to an Australian Rules football match or caught a train in Tokyo, know what it’s like to ‘battle’ a crowd, but I’m here to tell you that these events don’t even come close to the experience at Jin’An temple on CNY morning… we are talking not thousands, but hundreds and hundreds of thousands of people working their way to pray. Once again, words cannot express the reality or awesomeness of this. 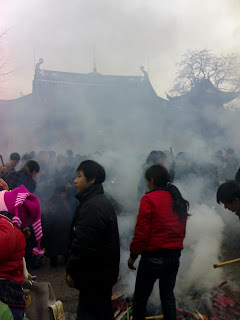 I think I’ve come full circle when it comes to being a child… on Lunar New Year eve, I will be out there on the streets again with all my friends and family (risking life and limb) to let off fireworks… I will also be out there on certain other times and days as the traditions dictate. It’s all fun – but with real meaning and belief as the motivation. To look across the Shanghai skyline and see the fireworks is amazing… to feel the earth literally move with the vibrations of the explosions – wow!! This Saturday evening, we will once again fly to Shanghai to begin the celebrations. Not only am I looking forward to taking some (very well-earned) vacation time, I am extremely excited to once again play a part in this now annual pilgrimage to be with family and partake in the traditions and culture. This will be our baby Jaime’s third trip to the metropolis. I can eat and drink with the best of my relatives – and I play a mean game of mahjong as well (speaking through with Shanghai dialect). I look forward to dieting again when we return to Singapore – I suspect the celebrations might be worth at least an extra 5kg of excess weight. Wow, what a fantastic video!! Have a good trip to Shanghai, Gong Xi Fa Cai! @ dead_cockroach - cheers bro!! It is a good experience to have both east & west culture!